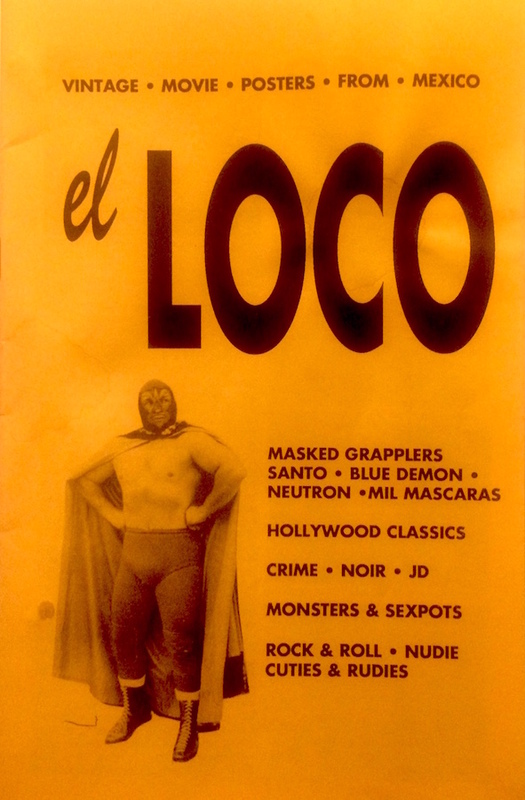 IN 1993, WE PRODUCED A CATALOG/FANZINE OF MEXICAN MOVIE POSTERS CALLED EL LOCO. IT'S BEEN OUT OF PRINT FOR PUSHING 25 YEARS. TO COMMEMORATE THIS ANNIVERSARY, WE HAVE REPRINTED EL LOCO AND ARE OFFERING ALL OF THE REMAINING POSTERS AT THEIR ORIGINAL 1993 PRICES. HOW ABOUT THAT! WE SHOW ABOUT 450 MEXICAN LOBBY CARDS HERE AND THERE ARE MORE TO COME. THESE ARE FROM OUR PERSONAL COLLECTION. MEXICAN LOBBY CARDS WERE LARGER THAN THEIR AMERICAN COUNTERPARTS-- THEY ARE MORE LIKE THE SIZE OF A HORIZONTAL US WINDOW CARD- GENERALLY 11" X 17". PERFECT FOR FRAMING. CATCH THESE WHILE YOU CAN. IT'S THE END OF THE ROAD WITH THEM. EL LOCO HAS BEEN REPRINTED IN A LIMITED EDITION OF 66 AND IS AVAILABLE FOR YOUR EDIFICATION, INFORMATION AND AMUSEMENT FOR THE ORIGINAL 1993 PRICE OF $5. YOU CAN'T BEAT THAT WITH AN EL STICK!